Why good is good enough in employee engagement. Reading time = 1 minute. We need to keep things simple and real with employee engagement. I think when we move to superlatives such as great work and exceptional engagement we create a credibility gap and a trust issue. I have been in a number of workplaces that declared they were great workplaces yet many employees tell me it is not as great as they say. Good work is both believable and attainable and sustainable. When we strive for good we will at time touch great or exceptional. I will take consistent good days of work over a few great days anytime. I also like how good work done with both intention and consistency will at times touch greatness. 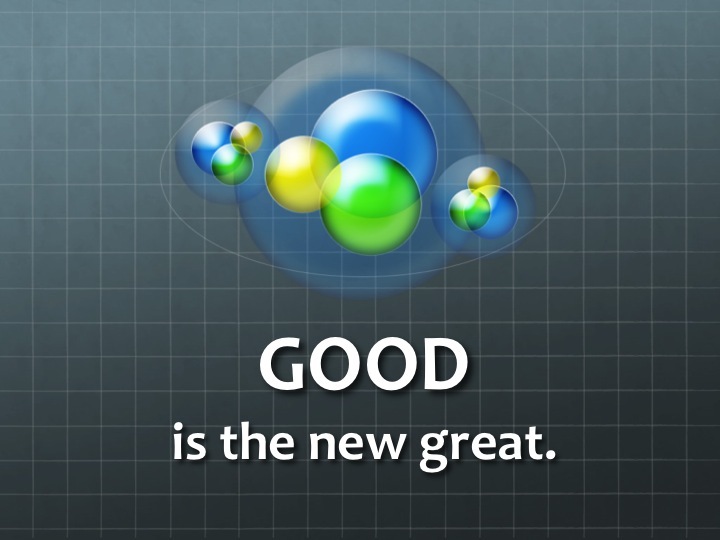 I like good in reference to employee engagement because it refers to both the adjective of good or the quality of work and the noun of good about the benefit of the work. I like work that is of good quality and is good on many levels for employees, customers, and the organization. I hope you have a good day of work that is also good for others. David Zinger is an employee engagement speaker and expert striving to do good work every day.